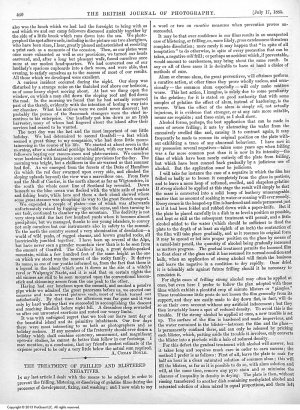 Arran in Autumn is an article written by Arthur Conan Doyle and published in The British Journal of Photography on 17 july 1885, as part of a series of article called "Where to go with the camera". (17 july 1885, p. 459) © bjp-online.com. 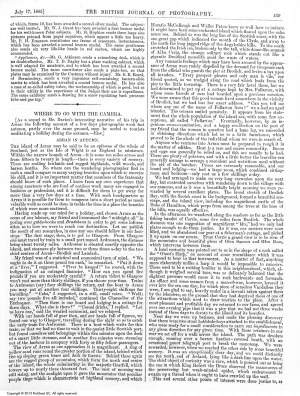 (17 july 1885, p. 460) © bjp-online.com. The island of Arran may be said to be the epitome of the whole of Scotland, just as the Isle of Wight is an England in miniature. Within the narrow bounds of Arran — it is some ten miles across and from fifteen to twenty in length — there is every variety of scenery. There are smiling lowlands and rugged highlands, wild woods, and barren heaths. Nowhere can the wandering photographer find in such a small compass so many varying beauties upon which to exercise his skill, and it is an important matter that members of the fraternity should know of such places. I know from my own experience that among amateurs who are fond of outdoor work many are engaged in business or professions, and it is difficult for them to get away for more than a very few days at a time. With such headquarters as Arran it is possible for them to compress into a short period as much valuable work as could be done in treble the time in a place the beauties of which were more scattered. Having made up our mind for a holiday, and chosen Arran as the scene of our labour, my friend and I consumed the "midnight oil" in poring over guide-books and Bradshaws in order to get some information as to how we were to reach our destination. Let me publish the result of our researches, in case anyone should follow in our footsteps. The first stage, then, is to get to Glasgow. From Glasgow one must travel by train to a small port named Ardrossan, the distance being about twenty miles. Ardrossan is situated exactly opposite the island, and steamers ply between two or three times a day to the two chief centres of Arran — Brodick and Lamlash. My friend was of a statistical and economical turn of mind. "We ought to do it on three pound ten each," he remarked. "Put it down at a 'fiver,' " I suggested. "Fiver be hanged!" he roared, with the indignation of an outraged financier. "How can you spend five pounds if you are moderately careful? A return ticket to Glasgow won't cost more than thirty shillings, if you choose your time. Trains to Ardrossan (say) four shillings the return, and the boat to Arran you may put at another four shillings. Thirty-eight shillings for travelling." "Cabs," I suggested, in a still, small voice. "Well; say two pounds five all included," continued the Chancellor of the Exchequer. "Then there is our board and lodging in a cottage for three days. What else is there?" "Casual drinks," I replied. "Let us have one," said the wearied economist, and we relapsed. With our hands full of gear then, and our heads full of figures, we found our way to Glasgow, travelling during the night so as to catch the early train for Ardrossan. There is a boat which waits for this train, so that we had no time to wait in the quaint little Scottish port, but found ourselves and belongings within five minutes upon the deck of a smart little steamer, and in another five minutes were steaming out of the harbour in company with forty or fifty fellow passengers. The view of Arran as one approaches it is magnificent. A ring of yellow sand runs round the greater portion of the island, behind which rise up sloping green braes and dark fir forests. Behind these again are the rugged group of mountains, which form the north and centre of the island, the whole culminating in the majestic Goatfell, which towers up to nearly three thousand feet. The mist of morning was still rising, and the sunlight upon it gave the mountains that peculiar purple tinge which is characteristic of highland scenery, and which Horatio McCullough and Waller Paton knew so well how to imitate. It might have been some enchanted island which floated upon the calm azure sea. Behind us was the long line of the Scottish coast, with the one great gap which indicated the mouth of the Clyde, and away to the north the long jagged ridge of the Argyleshire hills. To the south stretched the Irish sea, broken only by the tall, white dome-like summit of Ailsa Craig, the strange solitary rock which stands out like a gigantic Druidical monolith amid the waste of waters. Any romantic feelings which may have been aroused by the appearance of Arran were rudely dispelled by the demand for twopence each from the official who guards the pier at Brodick, and levies a tax upon all invaders. "Every prospect pleases and only man is vile," my friend quoted, as we trudged along the road which leads from the pier to the little township. There is a very fair hotel there, but we had determined to put up at a cottage kept by Mrs. Fullarton, with whom some friends of ours had boarded upon a previous occasion. We were aware that this good woman lived somewhere in the vicinity of Brodick, but we had lost her exact address. "Can you tell me where any one of the name of Fullarton lives?" we asked an aged islander. The veteran smiled pensively. It appears from his statement that the whole population of the island are, with some few exceptions, all called "Fullarton." Eventually, however, by an ingenious cross-examination, and a happy recollection on the part of my friend that the woman in question had a lame leg, we succeeded in obtaining directions which led us to a little farmhouse, which proved to be the abode of the individual whom we were in search of. Anyone who ventures into Arran must be prepared to rough it in the matter of edibles. Meat is a rare and scarce commodity. Bacon and eggs can generally be relied on, and fish are usually to be had. There are plenty of potatoes, and with a little butter the traveller can generally manage to arrange a succulent and nutritious meal without the aid of a butcher. Prices are extremely reasonable, and our board and lodging — we had a large room, which combined sitting-room and bedroom — only cost us a few shillings a day. We had arranged to make no very long excursions upon the next day, but contented ourselves with wandering down to the village with our cameras, and as it was a beautifully bright morning we were rewarded by several excellent places. The broad stretch of Brodick Bay, with the Scotch coast in the background, formed a beautiful seascape, and the inland view, including the magnificent castle of the Duke of Hamilton, which peeps from among the trees at the base of the hills, was equally effective. In the afternoon we wandered along the seashore as far as the little fishing hamlet of Corrie, some five miles from Brodick. The whole distance was one suggestion of magnificent "bits," had we only had plates enough to do them justice. As it was, our carriers were soon filled, and we abandoned our gear at a fisherman's cottage, and picked it up again on our return. From Corrie a grand view is to be seen of the mountains and beautiful glens of Glen Sannox and Glen Ross, which intervene between them. A local curiosity was pointed out to us in the shape of a rock called the "Giant's Harp," on account of some resemblance which it was supposed to bear to the instrument. As a matter of fact, anything more elaborately unlike a harp it would be impossible to conceive. There used to be a rocking boulder in this neighbourhood, which, although it weighed several tons, was so delicately balanced that the slightest pressure would cause it to rock backwards and forwards. An officer and some seamen from a man-of-war, however, levered it over into the sea one day, for which piece of senseless Vandalism they were, I am glad to say, heavily mulct in a lawsuit taken against them by the islanders, on the ground that they had deprived them of one of the attractions which used to draw tourists to the place. After a most pleasant and profitable day we returned to our farm, and agreed over our evening pipe that it was a pity that we had not three weeks instead of three days to devote to the island and its beauties. Next day we were up betimes, and made the pleasing discovery that there were two stout hobbledehoys attached to the establishment, who were ready for a small consideration to carry our impedimenta in any given direction for any given time. With these retainers in our rear we set off for a walk across the island. The path was desolate enough, running over a barren heather-covered heath, with an occasional gaunt telegraph post to break the monotony. We were rewarded, however, when we reached the other side by some beautiful scenery. It was an exceptionally clear day, and we could distinctly see the north end of Ireland, lying like a dark line upon the water. The chief object of curiosity was a cave, which is pointed out as being the one in which King Robert the Bruce observed the manoeuvres of the persevering but weak-minded spider, which endeavoured to swarm up a thread when it ought to have crawled up the wall. This and several other points of interest were done justice to, as also was the lunch which we had had the foresight to bring with us and which we and our camp followers discussed amicably together by the side of a little brook which runs down into the sea. We photographed the spot afterwards, including in the picture our two aboriginies, who have been since, I hear, greatly pleased and astonished at receiving a print each as a momento of the occasion. Then, as our plates were once more exhausted as well as our provisions, we turned our heads eastward, and, after a long but pleasant walk, found ourselves once more at our modest head-quarters. We had converted one of our landlady's spacious cupboards into a dark room, and were able, that evening, to satisfy ourselves as to the success of most of our results. All those which we developed were excellent. A curious incident occurred during the night. Our sleep was disturbed by a strange noise on the thatched roof above our bedroom, as of some heavy object moving about. At last we flung open the window, on which a man slid down the sloping roof and fled down the road. In the morning we found that he had actually removed part of the thatch, evidently with the intention of boring a way into our chamber. What his motives were we could never discover; but probably the purses of Sassenach strangers were the chief incentives to his enterprise. Our landlady put him down as an Irish harvester, many of whom had lingered about the island after their services had ceased to be wanted. The next day was the last and the most important of our little holiday. We had determined to ascend Goatfell — a feat which seemed a great thing to my companion, who had done little mountaineering in the course of his life. We started at about seven in the morning, after a substantial porridge breakfast, with our two faithful followers bearing our camera-cases and plate-carriers. We ourselves were burdened with knapsacks containing provisions for the day. The morning was bright, but a chilliness in the air warned us that summer had fled. As we emerged from the forests of the Duke of Hamilton (in which the red deer swarmed upon every side, and climbed the sloping uplands beyond) the view was a marvellous one. From Bute and the Mull of Cantire, in the north almost as far as Wigtonshire, in the south the whole coast line of Scotland lay revealed. Down beneath us the blue ocean was flecked with the white sails of yachts and fishing boats, while here and there a dark cloud showed where some great steamer was ploughing its way to the great Scotch seaport. We expended a couple of plates — one of which was afterwards unfortunately ruined by fogging — upon the scene, and then turning to our task, continued to clamber up the mountain. The declivity is not very steep until the last few hundred yards when it becomes almost precipitous, but we managed, thanks to our young islanders, to convey not only ourselves but our instruments also in safety to the summit. To the north the country seemed a very abomination of desolation — a world of wild peaks, of rugged chasms, and brown gnarled rocks, all inextricably jumbled together. I have been up several of the Alps, but have never seen a grander mountain view than is to be seen from the summit of Goatfell. The Carline's Leap, a great double-peaked mountain, within a few hundred feet of the same height as the one on which we stood was the nearest of the rocky family. It derives its name, as one of our youths informed us, from the fact that there is a legend in the island which sets it down as the site of a witch's revel or Walpurgis' Nacht, and it is said that on certain nights the old sinners are still to be seen mounted upon the conventional broomstick and skimming across from one peak to the other. Having had our luncheon upon the summit, and smoked a pensive pipe while we admired the great panorama before us, we erected our cameras and took several pictures each, most of which turned out satisfactorily. By that time the afternoon was far gone and it was only by hard walking that we succeeded in accomplishing the descent and reaching Brodick before night fell. A dreamless sleep rewarded us after our unwonted exertions and rested our weary limbs. It was with unfeigned regret that we took our leave next day of the beautiful island and its primitive inhabitants. Our few days there were most interesting to us both as photographers and as holiday seekers. If any member of the fraternity should ever desire a holiday which shall combine economy, amusement, and magnificent open-air studies, he cannot do better than follow in our footsteps. I may mention, as a conclusion, that my friend's modest estimate of the expense proved to be only a very little below the actual sum required.